Should you wish to book, we’ll send you our Booking Forms for you to complete & return. A £50 non-refundable deposit secures your booking with the balance due a month before the holiday begins. We also ask for a £75 damages bond that will be returned once the caravan has been checked and all is left as it was found. Payments can be made via bank transfer. The season runs from March to January and even though the majority of our bookings are Friday to Monday and Monday to Friday, we CAN accommodate short breaks, long breaks etc. Just give us a holla for a price. Check-in is from 4pm and check out by 10am. Our prices include fresh bed linen, gas, electric, water and of course fresh air. Please note, prices do not include passes. 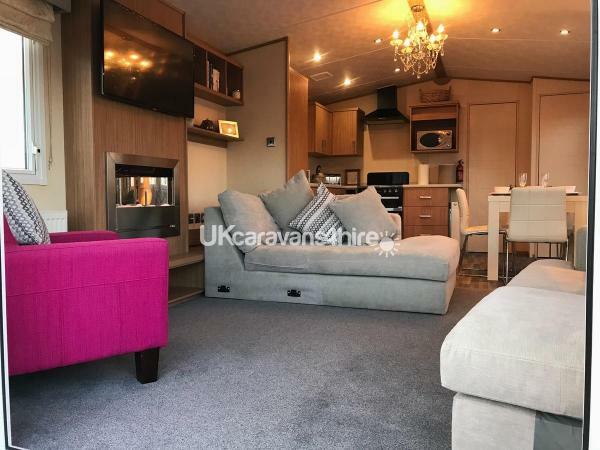 The lounge has two sofas (and a funky coloured armchair), wall mounted 42” TV (with Freeview), books & games for the family and an electric fire for those cosy nights in. The dining table seats four but extends to double the size, so if you fancy a romantic candlelit dinner or a full on family breakfast, we’ve got you covered. The modern kitchen is fully equipped with a fridge/freezer, cooker, hob, microwave, kettle and toaster. We’ve provided saucepans, baking trays, dinner set, cups, mugs, glasses, cutlery and there’s ample cupboard space to store your holiday treats and goodies. Beneath the sink you will find spare bin liners, slate place mats, an iron and a variety of cleaning products. Premium quality mattresses in all bedrooms and the comfiest pillows we could find, guarantees a decent nights sleep in preparation for your next hard day of holidaying. There are fitted wardrobes, overhead storage and wall mounted mirrors in all bedrooms as well as a TV in the master. Boasting a huge ‘wrap around’ decked area, you can relax on the rattan furniture with a good book whilst listening to the waves and watching the world go by. The gate to the decking has a lock for added security should the kids (or dog) try and escape to the beach!! And a dedicated parking space right outside the door means unloading your car is made quick and easy for your convenience - so your holiday can begin right away. 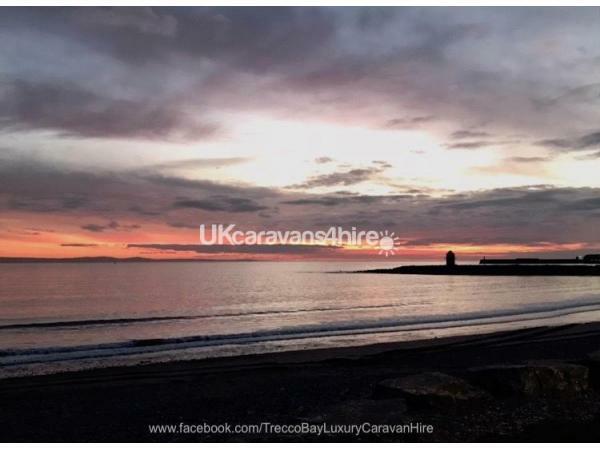 Trecco Bay is situated in the popular holiday destination of Porthcawl, which lies on the beautiful Welsh South Coast. 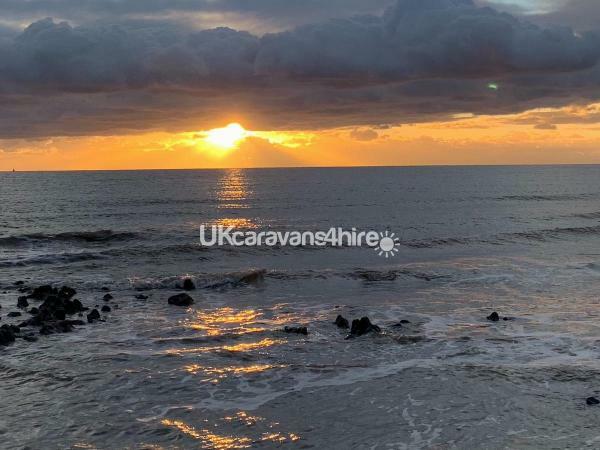 This multi-award winning site is owned and operated by Parkdean Resorts and sits on the edge of an extensive promenade and several beaches, two of which are Blue Flag beaches. 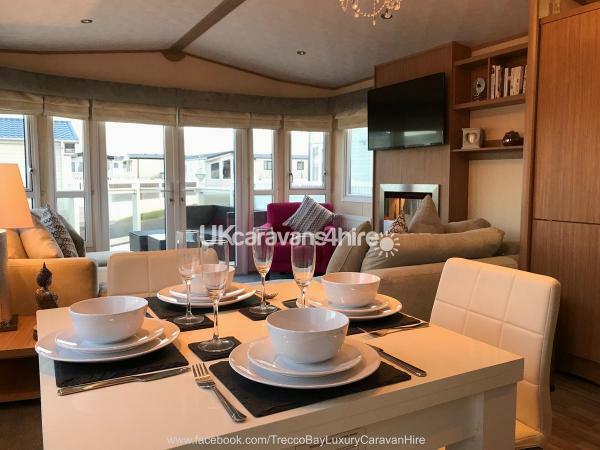 Ideally situated between Cardiff & Swansea and only a short distance from Junction 37 off the M4, the site is in easy reach of a wide range of tourist attractions. 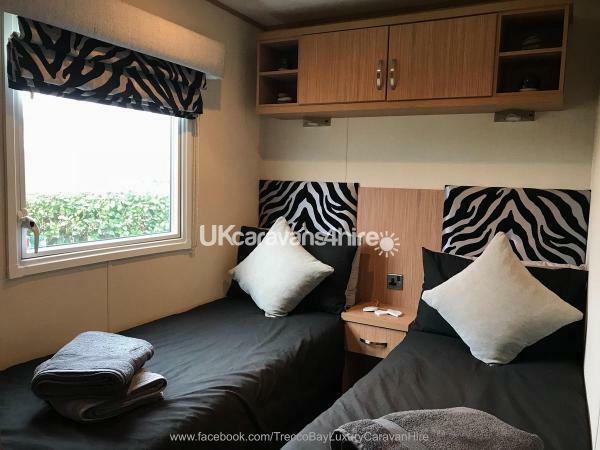 Once on site, our caravan is in the most perfect of spots for those of you wanting to have your own little hideaway in the quiet cul-de-sac of Greenacres. The park entertainment is literally a minutes walk away (no joke - leave Greenacres, turn left and you’re there). 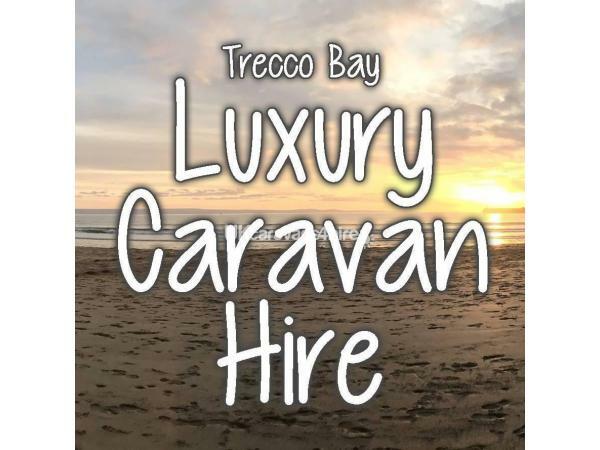 And Trecco Bay’s Blue Flag, dog friendly beach with its stunning sunset is also just a minute’s stroll (leave Greenacres, turn right and you’ll see the beach in front of you). Venture out of the park to Coney Beach fun fair which is about a 10-minute walk, along with Porthcawl town centre just a little further on. There are stunning coastal walks and a multitude of local attractions right on your doorstep. A relaxing break, a place to take the kids to burn off their energy or walking holiday with your pooch, it’s all right here. Passes are not included in the booking fee, these can be purchased from the Owners Elite Office (Tel: 01656 774 360) for £25 a week or £15 for 3 days (under 2’s are free). Passes give you access to the Showdome, Time-Out bar and Splashland (swimming). Everything else can be accessed without a pass and there’s plenty to do off-site so purchasing a pass isn’t necessary. Kids' clubs, the fabulous Splashland indoor pool, wet and wild outdoor play, bowling, bingo and adventure golf and that's just for starters! When you're not whizzing down zip wires and watching live shows, you're only a hop, skip and jump from a Blue Flag beach and countless other fantastic attractions. Toddlers and pre-schoolchildren under age 4 can join Lizzie the Lizard and have plenty of fun with the fantastic Tot Stars activities. So much to do, your tots will be making their own instruments and music, painting, enjoying stories, nursery rhymes and much more. Sid and Lizzie can't wait for you to join them in their Star Landers Club for children aged 4-10, it's non-stop fun! Children will love making new friends and take away lasting memories of fun filled activities, stories and games. With a carnival parade and disco, you'll have so much fun! Our Freestyle Club for 10-15 year olds is a great place to hang out, make new friends and try some pretty cool stuff. It's available during the school holidays. Film Making / DJ Workshops / Competitions / Talent Shows. 6 lane mini ten-pin bowling / Adventure Golf / Adventure play area with slides / Arcade Zone amusements / Beaches, beaches, beaches / Dodgems / Pool tables / Satellite TVs for live sporting events / Splashland Family Indoor Heated Pool / Two multi-sports courts / Wet Play Area / Zip wire. Here, at this 1200-seater venue, you can enjoy a night of fantastic family fun. Take your seats for incredible shows and live performances with big screen technology, spectacular costumes and choreography, plus great stars of tomorrow. If you are looking for an adult (over-18’s) only venue with a relaxed drinking environment and contemporary surroundings, then head to the Timeout Bar, it’s the perfect place to relax after a busy day on the park. Enjoy a game of cash bingo and weekend cabaret acts. 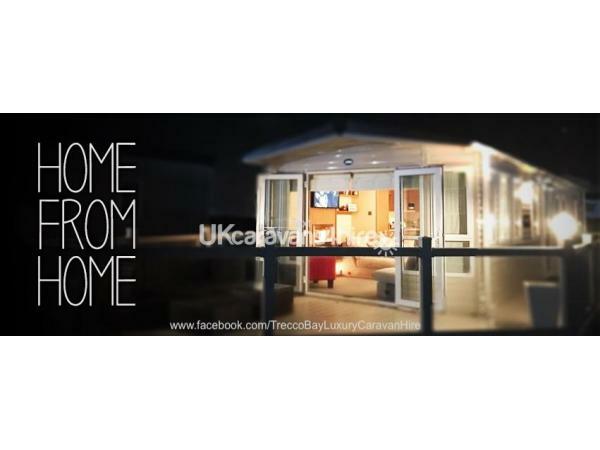 The Coast Bar & Kitchen is a welcoming place at Trecco Bay Holiday Park. Head there for an extensive family menu, a few drinks or to watch the big screen. There is also a terrace overlooking the adventure play areas so you can relax with a drink while the kids burn off some energy. Bay View Fish & Chip Shop / Coast Bar & Kitchen / Costa Coffee / Deli On The Deck / Legends Diner (50’s Rock & Roll Themed Diner) / Papa John’s Pizza. Saint Mary’s Church / Surfing Equipment and Gift Shop. 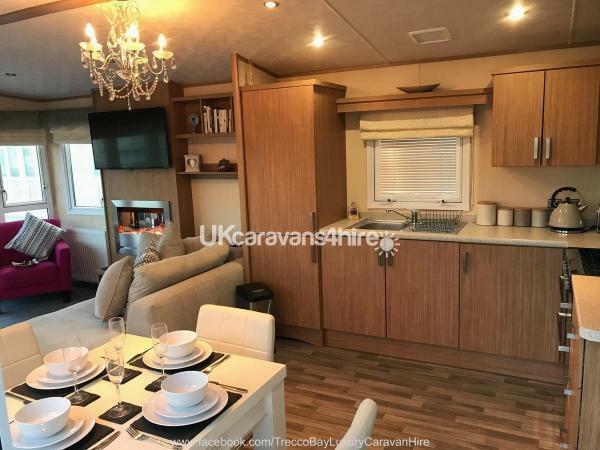 Lovely caravan .great location took our fur baby he absolutely loved it usually the caravans you can rent with a dog are horrible this one is beautiful and so clean . the owners could not be faulted so very helpful. We went for a quiet weekend just to rest it was just what the doctor ordered purfect . We have already booked to go back . Stayed here for a weekend with family, and it was absolutely perfect. 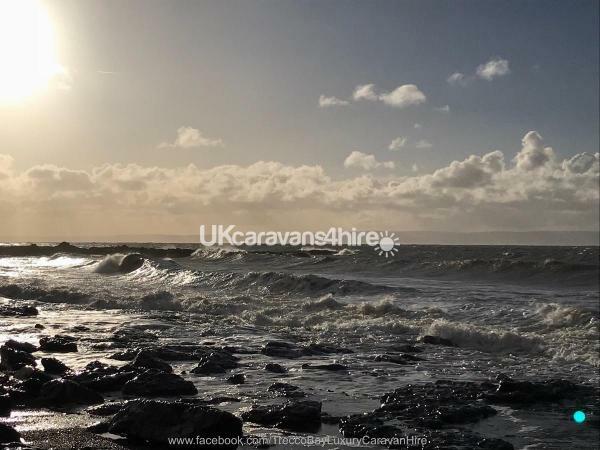 The caravan is a lovely area of the park, perfectly located for both the beach and the entertainment complex. On arrival we were pleasantly surprised to find that the owners had left us a small hamper as a welcome gift, which was a lovely touch. 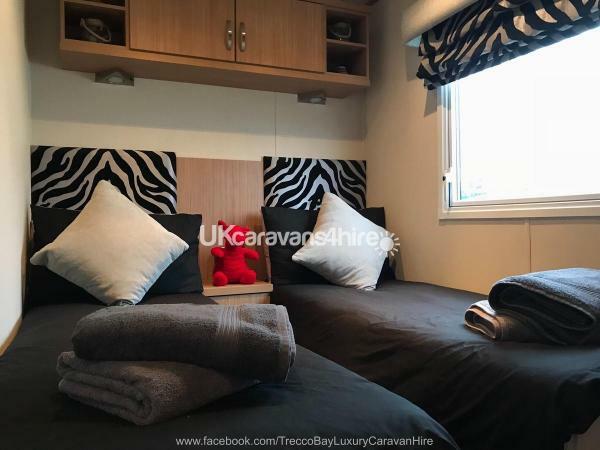 The caravan is absolutely spotless clean and has everything you need whilst away from home. Beds were made up ready, so no messing about putting duvet covers on! 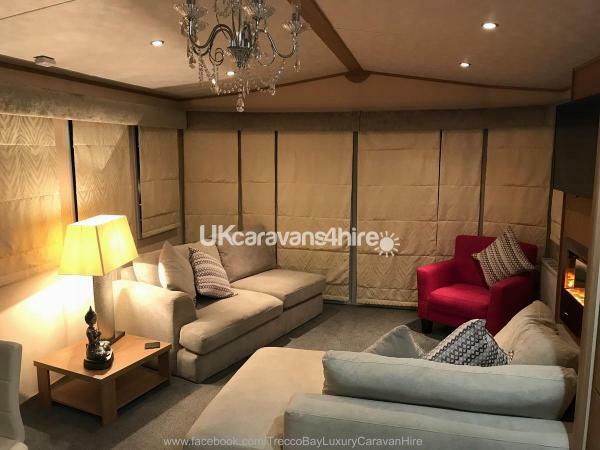 It has a lovely lounge and kitchen area with a good size tv, and the sofa is really comfortable, alongside a funky armchair! Whilst the weather wasn't suitable when we stayed, the outside decking area would be great in sunny weather. And finally, the owners are brilliant and can't do enough for you. Highly recommended. 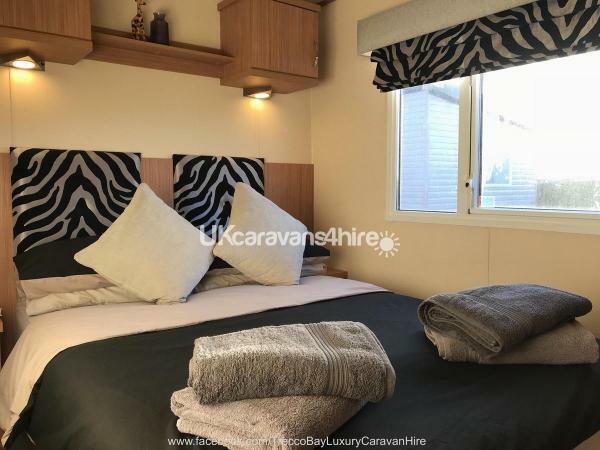 I wish there was a higher rating I was allowed than the 10.Stayed quiet a few times last year after finding this jewel in the crown with excellent owners who always put their guests first .Excellent holiday home on a perfect part of the park so near the sea . We had such an amazing family holiday in this beautiful caravan. It was absolutely stunning and extremely clean. The attention to detail was second to none which made our holiday that’s little bit more special. We can’t wait to come back to create many more wonderful memories. Thank you to such caring owners ??? ?